So last night Deacon tells me that he was scared to go sledding... he did NOT want to go. 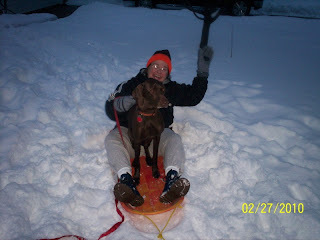 Well, he wanted to go to the snow, but he did not want to go sledding. I knew this would probably be an issue seeing as though he's not a fan of rides, slides, etc... I figured sledding would be no different. So all evening we're trying to convince him that it will be fun... but nothing is working. And finally I had an epiphany. Me: "mom, is it dark yet?" 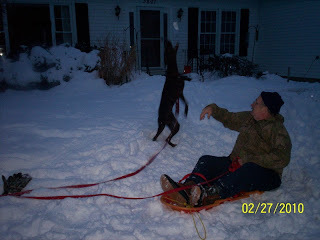 Me: "Deacon is scared of going sledding tomorrow and I need for him to see how much fun it is. 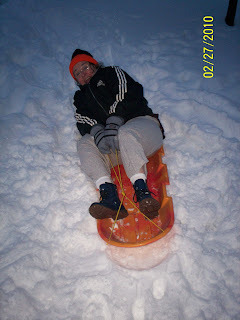 So I need you and dad to go outside and take pictures of you sledding and having fun." My parents literally had 20 minutes before it was going to be pitch black outside... and they were in their pajamas (had just taken showers and eaten dinner). So my dad runs up into the attic and finds my old sled and they both quickly change... just so they could go out into their front lawn and take pictures for my baby boy. And it worked. Today after sledding Deacon said that he wasn't scared "because of Grandma and Grandpa"-- and he said this with no prompting from me or Damien. See mom and dad- it was totally worth it. Love you!!! This is SOOO great! I love the look on your mom's face! That would convince anybody to go sledding! OMG! Only your parents! I just LOVE them! That is so fantastic!!!! Your parents are soooo funny! How awesome are they? !